Cutest little dog in the world!! Pedro is now 5 months old. My Chihuahua Maltese mix is gentle and sweet, but a real clown at times. His 'party trick' for attention-seeking has been, from age 2 1/2 months, to flip his bed upside down onto his head and gallop around the house underneath it!! He has even chewed a hole in the bottom of it now and when he's not running around underneath it, has got his head pushed through the hole and sometimes goes to sleep like this! 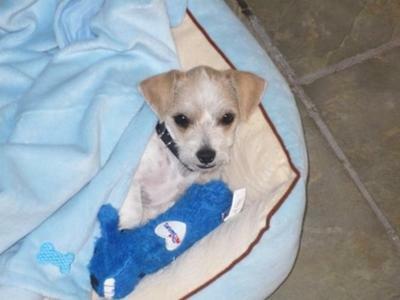 We got him when he was 7 weeks old, (I found him by doing a search on the net for Maltese Chihuahua mix). The people I bought him off gave me a list of the diet he had been on; I saw he had been used to getting warm milk with breakfast. I would have continued to do so had I not been told by the lady at the local pet shop (where I bought his expensive kibble), milk is no good for puppies so I did not offer him any. For the first 4 mornings after I got him, he would eat his kibble a bit, then come out to the kitchen, look at me and softly whimper (oh so quietly and sooo cute) for his warm milk!! It took all my willpower to not give in to him! However,he was smart enough to know after day 4, warm milk was off the menu for good and he gave up wimpering for it! He also used to carry his stuffed bear bed toys to his food and his pee pad (I'm sure he thought they were his litter mates, also sooo cute to see my Maltese Chihuahua do this). He has loads of character, is very expressive, 'talks' to me when he's playful, makes noises like an Ewok. My husband and I think my Chihuahua Maltese not only the cutest, but also 'the best little dog in the world'! s m.c.y nearkansas puppy 8 weeks, I am a first time owner. I would can use any advise.! I am sending a pic. To Get YOUR OPPO IN If He Is More Maltise OR chiwawa? is there a way for me to text a picture to you. YOU CAN TELL BY HIS PICTURE THAT HE IS A HANDSOME BOY AND MAYBE HE MIGHT JUST KNOW IT. BUT HE IS A CUTIE AND I LOVE HIS COLLAR. YOU GOTTA LOVE A FACE LIKE THAT AND A PERSONALLY TO MATCH. I LOVE HIS EXPRESSION....HE ALMOST LOOKS AS IF HE IS GOING TO TALK. Two Paws UP! for Pedro! Return to Tell Us About Your Malchi!. You can guess by the name that Pistol is a real Pistol. 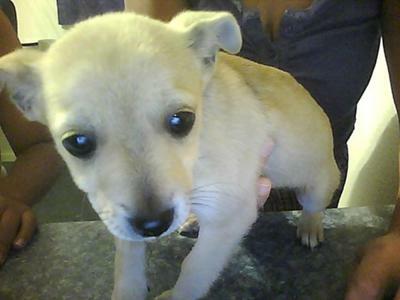 We got our Chihuahua Maltese mix at 6 weeks and he weighed just 1 pound. He is now 15 months old and has settled in at about 5 pounds. 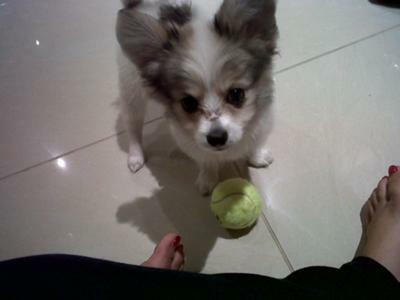 He has the big chest, apple head, solid stance of a Chihuahua and the adorable nose and big eyes of a Maltese. His hair is oddly some of both. He is black and white. The white being fine and longer (and sheds) the black being shorter and doesn't shed as much. Mostly he looks messed up all the time which is part of his charm. He likes his head messed up and if you try to comb him he immediately messes it up just right. Pistol is protective of our home and property but has never growled, nipped or bitten any of our 6 smaller grandchildren. He is always full of energy and NEVER meets a stranger. He thinks everyone comes to see him and he definitely enjoys it. He is also the smartest little thing. He knows commands such as "No Lick", "Time Out", "Lay Down", and of course "Treat". He pretty much lives to eat something or maybe I should say anything. Everyone who meets Pistol wants to know what he is, where he comes from, and can they get one. You can't much beat that. Oh he is so cute!!! I'm greatful you have a joyful pup. We live in Texas, and our Humans go to Oklahoma a lot for work and stuff, and they have a lot of friendz there too! We are glad you are sweet with the grandkids -- we know all your humans love you! Love, Your PaLs, LuLu and LoLLy! I bought this dog from a woman yesterday and she told me he was a Chihuahua Maltese mix. He is 6 months old and very sweet. I named him cutie because all I could say when I got him was "he's such a cutie." The only problem is I've never had a dog before and I don't know how to train him. I got my Chihuahua Maltese puppy these potty pads and he just will not use them. he keeps going all over my floor. I want him to use the pads because he is too small to go outside and I'm afraid a coyote might get him because I live in the desert. It is not the puppy that needs trained, but the parent's of the puppy's. Keep the puppy with you or in it's carry bed. when you take him out of it take him right outside or onto the pad and don't let him off until he goes. once he goes then he can run around for a while. when ever he eats take him back out or on the pad with in 15 to 30 min. In between if you are not holding him put him in the bed until you take him out again. You just train yourself on when the puppy needs to go. Then he will soon know how the routine works. 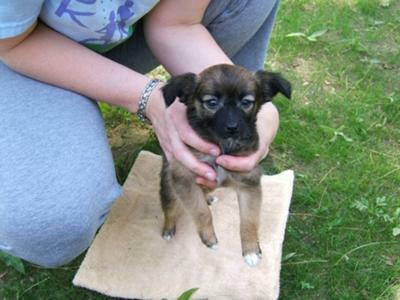 We had a Chihuahua/Pekinese mix that was just 5 pounds grown and was very well trained. 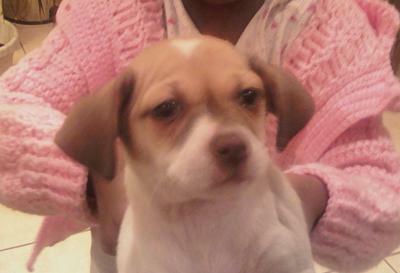 Now we have had our little Apple head Chihuahua/Maltese for 1 week and she is doing wonderful on training. Her name is Precious and she is helping us so much finding the love of a puppy after loosing our Littlebit of 13 years. She is funny, loving, playful and a real joy. She was 12 weeks old when we got her and weighed 1.8 pounds. You definitely don't want Cutie to be eaten by a coyote. The next time he goes potty, take the potty pad and sop it up. Clean up the rest of the area so that he cannot smell it on the floor anywhere else except the potty pad. Make sure to keep the potty pad away from his food and water bowls. Take him to his potty pad as soon as he wakes up from his naps or as soon as he wakes up in the morning. Hang in there, it is just like potty training a toddler. Be still for your close-up, Tiny! Tiny Dawg (Tiny) is our 3.5 lb. Chihuahua Maltese mix puppy. I fell instantly in love with him when I saw his picture, posted as a 'Chi-tese' on the internet, and went to get him right away. 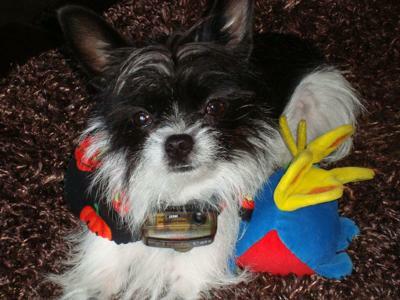 We think he is absolutely adorable and we love his boa-feathery look on his tiny Chihuahua frame! I haven't seen many Malchis that look like Tiny or are as little as he is, but he is just the perfect size for our female chi, Honey. They cuddle and play together all day long. Tiny's personality is generally calm and quiet, and sometimes he's a bit shy, but we always laugh at his bold guarding of the front door when he hears us rattle the knob. 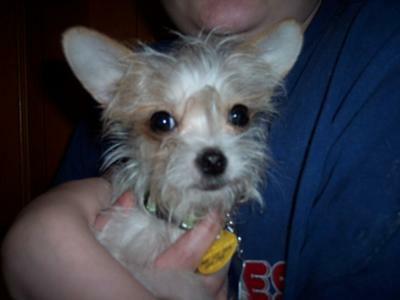 Tiny has a sweet and friendly personality and gets along really well with our other puppies and with our kitties, too. Two Paws UP! for Tiny Dawg! HI Tiny, We are 2 Maltese dogs LuLu and LoLLy! We thought we were little but you are tiny! Your pikture is very cute and we really like your hair! Two Paws UP! for the great post! Your Maltese paLs, LuLu and LoLLy! How cute your little one is !!!!! in the years ahead as you build many memories ! My Chihuahua Maltese mix looks more Maltese than Chihuahua. 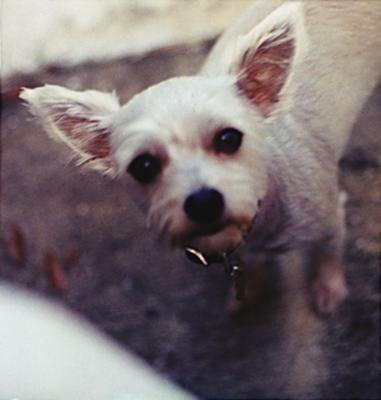 Many mistake her as being full blooded Maltese, but when she is shaved she looks just like her Chihuahua half. She is the sweetest dog. 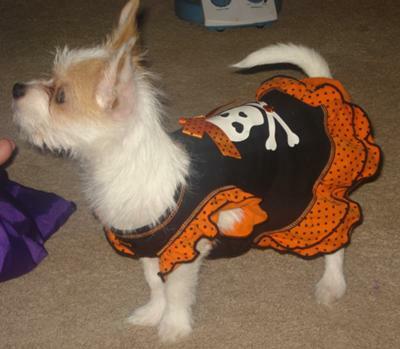 She is very energetic, loves to play with our Brittany Spaniel and loves to play tag with our cats. When she is not doing something she likes to cuddle up on the couch, and even though she is a small dog, some how she manages to take up most of the couch. But one down fall I believe happens with this mix of dog is that the Chihuahua has longer legs than the Maltese and breeding them together may cause a problem. Penny was born with deformed back legs. Her knees would constantly pop out of place. Which was very painful for her. The Vet told us eventually her legs would completely give out on her so when took preventive action and did knee surgery on her. The first surgery was a failure. Her legs were so deformed that it did not take and a specialist was called in. He said they were the worst he had ever seen. But the second surgery was a success, and Penny is once again up and running at the speed of sound. My Chihuahua Maltese mix is the kindest, sweetest, most caring dog you can ever have. Two Paws UP! for Penny! 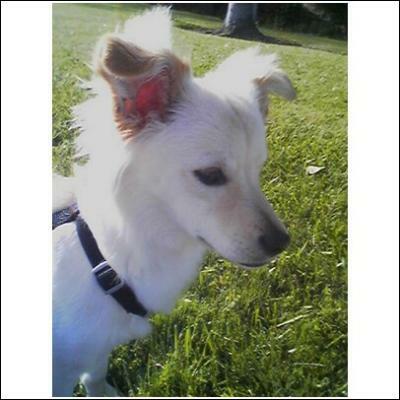 This is my beautiful little Chihuahua Maltese mix boy Inu! He is very smart, playful and has the funniest expressions. I got him at 7 weeks and he has been with me for almost 14 months. His ears are droopy like Maltese ears. His hair is kind of wiry but soft of course and of medium length. He has a shedding cycle but his coat is easy to maintain. He loves playing with my Chihuahua they are both boys. He has great temperament and loves to exercise. He usually gets suspicious of strangers but like ten seconds later he will lick their fingers clean. I love him sooo much!! My Malchi or Chihuahua Maltese mix, is two years old now and he weighs 6 pounds. 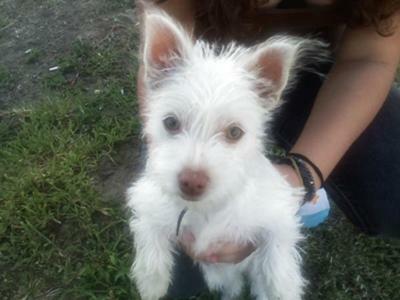 He was the only dog in his litter that looked more like a Chihuahua; the others looked more like Maltese. He's very spoiled and he loves to sleep! My puppy Reecey is a little over a year old. She ways about 6lbs. She is the sweetest dog and loves to be wrapped in blankets! I didn't know there was any other dog that looked like Reecey so it was fun to see a picture of your dog on Pinterest! Your Pancho looks just exactly like my boy TOBY. Two Paws UP! for Pancho!! Mitzi is the best little dog I have ever had. My Chihuahua Maltese mix is so lovable. She weighs 8lbs. She follows me everywhere I go and when I sit at the computer she lays on her pillow next to my feet until I get ready to leave. When I drive she likes to lay her head on my arm in my lap as I drive. My family says she is spoiled. But she is my little girl. That's what I call her Mitzi the little girl. This picture is when my Chihuahua Maltese was 6 months old. She is now 1 yr. I lov Malchiehichie the way she lo ok bols. I wanted a girl but This boy needed a momma. Rescue pup.we is yours Malchie? Is she spade? I am first time owner if breed. Any pointers? I got my Rescue Malchie yesterday. Two Paws UP! for Mitzi! Hi Mitzi! We are 2 Maltese dogs LuLu and LoLLy! Wow, you are super cute! Your pikture is adorable with your little yellow bow! Our favorite color is pink and purple! Also, we wanted to give you Two Paws UP! for the AWESUM post! Your Maltese paLs, LuLu and LoLLy! Emmitt our Chihuahua Maltese mix is 11 years old now and still the sweetest dog ever. The funniest thing about him is that when he is on your lap and you pet him and then stop, he will paw your hand to remind you to keep petting him. Also, he has to bury all his treats in the back yard. He doesn't play with toys or chew anything in the home. He is so good with people that I often get the threat of people wanting them for themselves. And on a few occasions he has run off and people returned him to me because of his tag, but admitted they didn't want to. His name comes from Dr. Emmett Brown from "Back to the Future" because he has white wiry hair that stands up crazy like the Doc when it gets longer. My friends with dog allergies LOVE our Chihuahua Maltese mix because he does not shed and they can be around him. He does need a groomer every 3 months or sooner. He is very Loyal. It is obvious that I am his owner. Despite years with my husband feeding him, it is ME he follows, sleeps next to, and looks to when he doesn't feel well. He was given up. A stray living with homeless people when a friend took him and brought him to me. The diet they gave him of sausages and cart food ruined his belly. At this point in time we deal with his poor digestive track and the damage to it. They have sensitive bellies, as most small dogs do. Take great care of their bellies. No table scraps, no people food, just the low fat dog food mixed with some Omega-3 for their coat and Cholesterol. 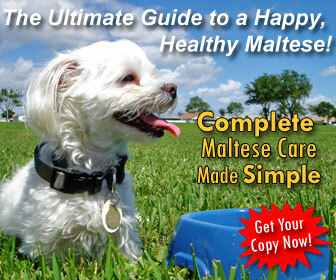 Maltese Chihuahuas need some crate training for potty issues, but not forever. Emmitt is my first dog and I could never have asked for better. Two Paws UP! for Emmitt! Our Chihuahua Maltese mix is the best thing that has come into our life. She is so intelligent, loving, and very playful. She loves to go for car rides, in fact we took her to AZ from CA. She was tremendous! I was so proud of her. No problems whatsoever. She loves our grandchildren and is good around the baby. I'm so glad I have her...I just love her soooo much!!!! She looks just like our Remy, i was afraid of dogs before remy and remy is the answer to my prayers, she luvs uncondiationally, i so luv her very much, she's God sent. Tell did you have trouble potty training.? My Chihuahua Maltese mix Lucy is now a little over 7 months old and is by far the best puppy I have ever had. 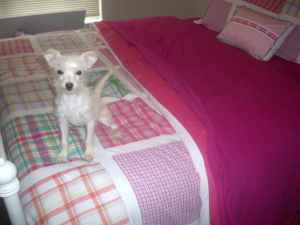 She is 9 pounds and comes from a purebred Maltese mama and marble coated pure bred Chihuahua papa. She loves to play with other dogs and is warming up to people. She is especially curious around babies and loves to run in circles around them until she gets them giggling. She has no separation anxiety and no issues with barking. In fact, very few people have ever heard her bark! She's quiet, but has lots of personality. My Maltese Chihuahua mix to play chase, fetch, and snuggle. She was relatively easy to potty train and is picking up on a few commands like sit, lay down, and stay. We love her so much and look forward to her Lucy dance of happiness when we come home everyday. My sweet little Chihuahua Maltese mix is about 14 months old. I have had him since he was a tiny little puppy. He is white with tan markings. His personality is so great you wouldn't believe it. I feel in love with him the moment i saw him. He's full of energy, love,and he also thinks he's the size of a horse... he is dominant to our male Cocker Spaniel and he is dominant to all of my moms male animals, and he just makes you feel better on a bad day. If you have never been blessed with a Chihuahua Maltese mix breed you would to own one if you like small dogs. But all in all you got to love them. Two Paws UP! for Tater Tot! Jax was just born three weeks ago by his mom Sadie she is a Maltese, his dad is a Chihuahua. He was born in a litter of lucky seven the all are so cute. I think we will really enjoy him cause we enjoy his mother. Teyla is a Moma's baby. She goes everywhere I go. She has to sleep with me or my daughter. She is a ball of energy, always chasing her tail or running laps around the living room. She is also pretty smart. She knows 3 of her toys by name and will go touch them when I ask her for them. Sometimes I get lucky and she actually will bring them to me. I like to think that she thinks fetch is boring... that's why she only brings the toy back a couple of times. Haha. She is only 5 1/2 months old so I don't think she is through growing yet but looks like she is going to stay pretty small. Finally! I have a malchi and his ears stand up and are large and he is black and white like your dog is brown and white. Most of the MALCHI dogs look so different than Yoda. They are WONDERFUL dogs. This is her about a year ago on the bed. My Chihuahua Maltese mix is about to turn 3 years old. She is VERY playful and VERY cute. She loves to eat and go for walks.She is very sweet, except she sometimes attacks. Yes, most Maltese Chihuahua mixes are sweet, yet feisty. She looks adorable. 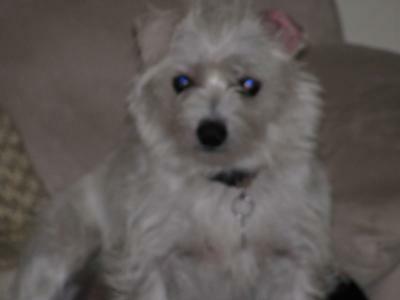 Toshiro is a mix of a Maltese mother named Osita (means little bear) and a Chihuahua father named poncho. He is a charismatic and loving dog. And was very easy to train since we trained him when he was very young. He just so happens to have a two tone color eyes. They are gray on the inside and a yellow/golden color on the outside. He is a loving dog and always wants to be with me. He had already learned so many tricks which is fast for a puppy who is now 4 months old!! My Chihuahua Maltese mix also loves to play with people or by himself as long as he has a toy. At times he does get jealous when other dogs are around and yet he never turns aggressive (barking, growling, snapping... etc.) He is also very amiable and loves being with people. even when he sleeps he likes to sleep right next to me on my bed. Luckily for me he doesn't shed much so there never extreme amounts of fur everywhere. I just love him and I don't know what i will do without him. I just love him from his scruffy fur, pointy ears, and cute pink nose. What a CUTIE! Toshiro is an extremely cute little boy and seems a joy. We just adopted a little girl this past weekend, GiGi, from a shelter where I volunteer. She is 3 months and was rescued from a puppy mill in Tennessee, but is very cuddly and sweet. Everyone had an opinion on her mixed breed. Then I saw Toshiro and she could have been his littermate, all white, dark and green/yellow eyes, red nose, big ears, super cute and great personality. 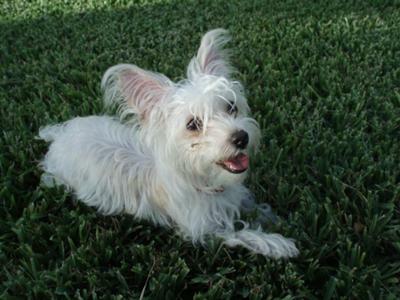 After seeing Toshiro I feel she must be a Chihuahua/Maltese mix, too. Thanks for the pic. Here's a link to her on tour local news. Two Paws UP! for Toshiro! We are tow Maltese dogs LuLu and LoLLy! We wanted to give you Two Paws UP! for your adorable pikture! WE love your ears! Also, Have you heard about our health care reform? Lots of dogs are signing up and you don't want to be left out! Join out coalition at http://www.luluandlolly.com! Your Maltese paLs, LuLu and LoLLy! We got our Chihuahua Maltese mix JoJo as a puppy from a pet store and fell in love with him as soon as we saw him. He is a wonderful part of our family. He is a Momma's boy. He stays with me where ever I go. He is a lap baby. He loves to be loved on but then their is a side of him that he wants to play too. He will go and get his toys and bring them to us and he tries to get us to get it from him and then we do and we throw it down the hall way. He returns it wanting more. I have two children and they adore him. He does very well with them. He likes to jump on their beds to give them kisses or just find a comfy spot to sleep. He also likes to go in the car. He loves to help drive the car with you. It is very funny. Sometimes we tell him we are going to Mamaw's and he gets so excited I swear he yelps Mamaw. He is a wonderful pet. We just love him a lot. 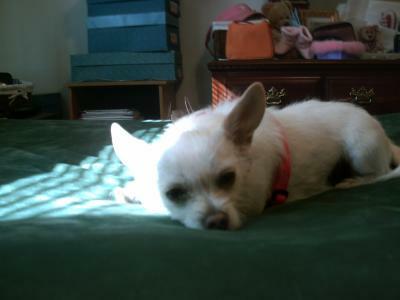 My Chihuahua Maltese mix Sweetie is 3 years old and is sooooooooooo very smart. I have owned many dogs, but find her to be the smartest one I have ever had. We have to spell words, and I still think she knows what we are saying. By far Sweetie is the best dog we have ever owned. My Chihuahua Maltese mix is the sweetest most loving little thing. He is 9 months old and is great with my kids and just loves everyone. 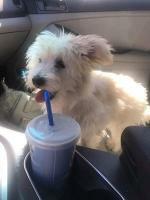 My Chihuahua Maltese mix is about 3 and a half months old and he is very playful. He rarely barks, only about once every other day. When he is lonely he cries a bit so he needs a lot of attention. He is a non shedding type. He is mainly white but has different shades of brown around his ears and he has a couple of dark brown patches. His favourite toy is his tennis ball! It took about a week to toilet train him, by rewarding good behaviours with treats. His coat is very fluffy and long and my Chihuahua Maltese is great to cuddle up with at night times in bed! Samantha, my Chihuahua Maltese mix, is 3 today (Nov 28). She weighs 6-7 pounds and is very quiet until she gets very excited about seeing someone, then the barking begins. She gets nervous shakes at loud noises: thunder, lawn crew, really loud TV noises, vacuum, etc..
She is very playful with her male Papillon companion. The run TOP SPEED through the house and yard when they get going. She is incredibly lovable and loves to lay down on the couch, constantly in contact with someone. HI..WE JUST RECENTLY GOT A MALTESE CHIHUAHUA MIX..SHE IS A FEMALE WE ALREADY HAVE A 8 MONTH MALE HE IS A PUG YORKIE MIX..HE LOOKS JUST LIKE A YORKIE..WE WERE JUST WONDERING HOW OUR NEW DOG MACI WILL LOOK AS SHE GROWS..HER HAIR IS NOT TOO LONG AND SHE IS ALL WHITE LIKE SAMANTHA..WAS SAMANTHA'S HAIR LONG AS A PUPPY ALREADY OR DID IT EVENTUALLY GET THERE...DID IT LOOK LIKE SHE WAS GOING TO HAVE LONG HAIR AS A PUPPY OR COULD YOU NOY TELL YET? 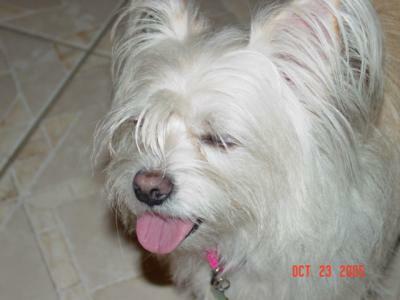 Dear Samantha, We are 2 Maltese dogs and dedicated Maltese Maniacs and we really loved this post. It is so sweet. We love to run at TOP SPEED too! And we are scared of thunder. Usually we try to use earplugs during the fireworks, but last summer we lost them and staying under the bed didn't do a bit of good. What a happy post from you and a cute pikture! Love, Your PaLs, LuLu and LoLLy! 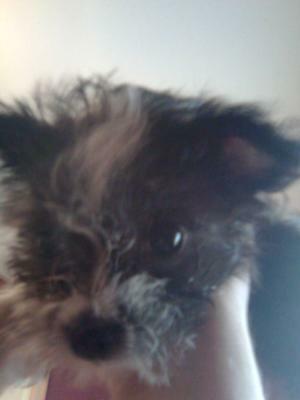 I fell in love with her my Chihuahua Maltese mix when I first seen her. U see she looks to me like my favorite disney dog. Lady in "Lady and the Tramp." I'm not sure she's Chihuahua mixed with Maltese cause she sure looks like that Spaniel. All 4 1/2 lbs. But whatever she is she's a keeper and very entertaining. Also she looks like a Lab pup miniture size. Yah. Also She loves table food. We know not to make that a habit but she wont eat her own if there food near. 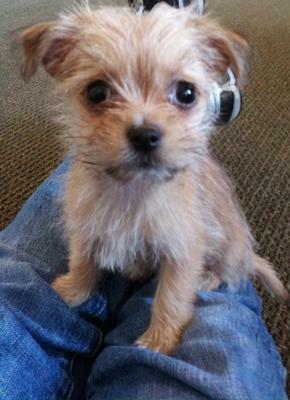 We got our Chihuahua Maltese mix Valentine when she was about 9 weeks old (this is the picture the day we got her). She was named that by the people we got her from because she has a heart shaped mark on the top of her head. Her eyes are hazel and she was the last one of the litter, it seems no one wanted her. She's about 8 months now and looks a lot like a Jack Russell Terrier. 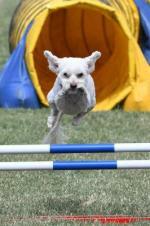 Our Maltese Chihuahua mix loves to run and jump. She chases her tail all the time. She hardly ever barks and when she hears the garage door open when my husband comes home she'll run back and forth crying and looking down the stairs until he comes in. Two Paws UP! for Valentine! My Chihuahua Maltese mix JoJo will turn 1 on Feb 8th. She has been the best dog ever. She is very affectionate an loyal. She loves to play fetch and to travel in the car. She is the best "little sister" to our 7 year old son. I'm a 10 month old Papillon named Tonto. JoJo is my favorite play date. She's been trying to teach me to use the doggie door. Mollie is pretty cute too and very tolerant of little pups messing with her stuff. And she's so cute and friendly and she came to my house for a play date. My little Chihuahua Maltese mix is 8 months old and I swear he is ADD. He gets bored in 10 seconds. He is super curious and extremely jealous of our other dog Peetie who is a Chihuahua mini Pincher mix. Peetie is totally mellow and really doesn't want to be bothered while Prancer is Mr Spaz. Prancer weighs 10 lbs and has really long legs which makes him an excellent jumper. That is how he got his name. When he was 3 months it was like watching a baby calf (water legs). When he plays he tends to swat like a Boxer. 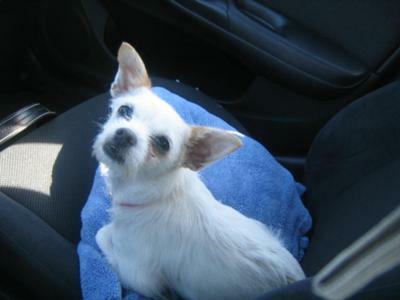 Our Maltese Chihuahua mix is a super loving dog and always wants to be on your lap. We just need to work on the jealousy. Two Paws UP! for the Prancer! Hi Prancer, We are two Maltese dogs LuLu and LoLLy! Are you a reindeer? We wanted to give you Two Paws UP! on your post! Also, have you heard about doggy yoga? It is truly eggselent! Check it out at http://www.luluandlolly.com! Your Maltese paLs, LuLu and LoLLy! We just got a Chihuahua Maltese mix puppy. Her name is Keiver (from Keith & Veronika). Her mama is the Chihuahua and her daddy is a Maltese. Everyone says she looks like a mini German Shepard. We love her!!! Bailey the Chihuahua Maltese mix was a gift to me from my boyfriend 2 years ago. When she was just 6 weeks old, and she looked like a cotton ball. Her parents were a Chihuahua and a Maltese, not sure which was which. She is the sweetest, most loving dog. She definitely asserts her dominants with the cat and ferrets, however never hurts them. At the dog park my Chihuahua Maltese barks at the Bull Mastiffs. Really a character. The coolest person I know... Bailey. My Chihuahua Maltese mix Goose is fearless. He is not interested in playing with other small dogs. His best friends are large dogs. He is extremely smart and does well in his training classes, but is very stubborn. He is 6 pounds at 5 1/2 months, and shouldn't be much bigger. 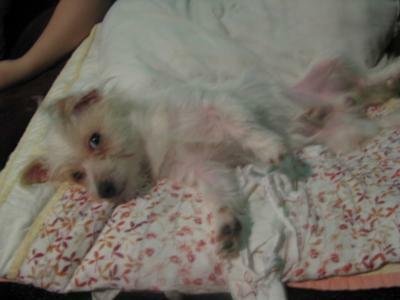 He has short wiry hair on his body and longer white hair around his face.He is tan and white in color, and even has spots on his skin all over tummy. Lucy on my lap ;P.
I picked my Chihuahua Maltese mix Lucy up 2 days ago and let me just say, I'M IN LOVE WITH HER!!!!!!!!! She's 10 weeks old and full of lovin. We've bonded in just 2 short days. 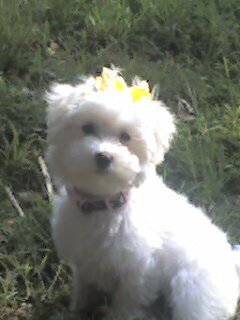 I really wanted a Maltese because of their temperament and because they shed very little, however, I think they're more than just a bit girly looking. I've always wanted a scruffy looking dog and, wouldn't you know it, I came across my Lucy who had all of the physical qualities I was looking for AND she's half Maltese! WOO HOO! Just look at that face - How couldn't you love her! I have 2 Russian Blue cats that I love VERY much, therefore, I'm taking it VERY slow with the introductions as recommended on several websites. Cheers to all that have a Malchi - Love them as you would a human!!! Lucy is adorable! Who wouldn't fall in love with that face. She is scruffy looking in the cutest way possible. Even at the size of 2 pounds, they think they are much bigger. My Morkie, Belle is full grown at 6 pounds and thinks she is just like her 85 pound Lab brother. It sure doesn't take them long to worm their way into our hearts. That is an adorable little scruffy dog. So full of personality. Muffit is a Morkie and looks scruffy most of the time. When I groom her, she is beautiful, but it only lasts a minute because she loves playing with our 20 lb. cat and our year old German Shorthair. At five months old today, she weighs probably six pounds. I fell in love with her when she was 2 days old! There is something about that Maltese mix that makes some good puppies. 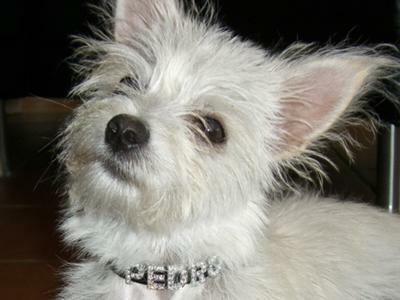 Delilah is the sweetest most lovable Chihuahua Maltese mix. She loves everyone, has never been aggressive towards anyone or anything. She loves to play, go for walks, and eat ice cubes and of course cuddle. She is now 9 months and about 13 lbs. Very soft Maltese hair, hardly sheds. She is the love of our lives!! We absolutely love our Chihuahua Maltese mix Hasting! (We got him from Hastings, Ontario). He loves to play, very loyal, loves kisses and cuddles and he is extremely cute! His mama was the Chihuahua and so he is white and golden. He is 6 pounds. When we take him for a walk we always get stopped by everyone because he is soooh cute! Our trainer suggested we should have called him Napolean because he is totally fearless! The only thing we have to work on is his barking when the doorbell rings and to people who visit us. When we leave our house he goes on our kitchen table and howls - he is very attached to us! He just turned one years old - Happy Birthday Hasting! He loves cheese and so for his birthday cake he got (guess! )a piece of cheese with a candle!!! We can't imagine life without him!!! I just met a couple in London who had little male of the same mix and he was so adorable and friendly. 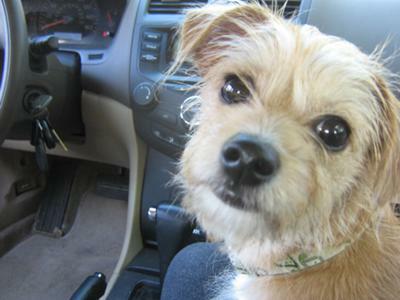 I am looking for a tiny dog and was looking for a Chihuahua, but after meeting Max, I would love a cutie like him. I had never heard of this mix before. Could I please ask the name of the breeder in Hastings where you found your little one? You can reach me at kibbles2@sympatico.ca. Can you please send me the contact info for the breeder you purchased your Malchi from in Hastings, Ontario? After not owning a dog in about 10 yrs I found my Malchi, or Chihuahua Maltese mix, on a local website and absolutely adore her. I can't imagine my life without her and don't know what I have done all these years without her. 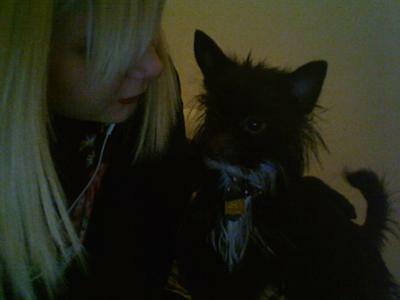 She is black and white and looks more like a Maltese than a Chihuahua. She doesn't like a bath very much and look out when she gets out of the tub, this lil girl goes absolutely CRAZY!!!! She loves to play outside and is very timid around other dogs. Everyday before I get my girls from school I pick her up so she can ride with me and as soon as they get in the car she gets so excited she doesn't know what to do. She definitely makes our family complete. I also have a black and white malchi his name is muppet and he is week's old! He has brought so much joy into our live's and I wouldn't trade him for anything! My Chihuahua Maltese mix is a lap dog very energetic. He has the cutest growl in the world and he is sneaky. He loves treats! If leave the house for work and you come back home he will try to give you a hug. He's only 1 years old, his b-day is Mar 13. My Chihuahua Maltese is black and white he is the cutest dog in the world. Little Bear AKA Nugget is my beautiful little Chihuahua Maltese mix baby. He follows me all over the house and when I come home he'll just jump and bark until I pick him up. I do believe he has Napoleon syndrome because he things he's big and bad, protecting his bone (against two 70 lb boxers), protecting me and the house. He'll continually bark when someone comes in the house. I've taught him a quiet command - sometimes it works sometimes not. When I take him to the park with our big dogs, he'll run as fast as his little legs will go to keep up. He wrestles with our cat and is very mischievous. As soon as he knows he's in trouble he'll roll on his back and look at you with big beautiful eyes... How can you be mad at such a cutie. Never thought I'd love a little dog (always had big ones) but love him to death. 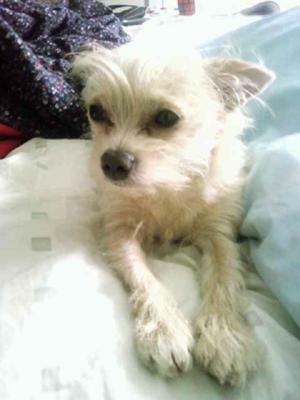 My Chihuahua Maltese mix or Malchi is two years old and is only three pounds. He loves to watch TV, play fetch. And when he wants his way he will drag his back legs and make baby like sounds. Binkey travels with me all the time. He is very sweet and love kids. His hair is now to the ground and when people see him they do not believe he is a Maltese mix. Little Binkey is truly a great joy in my life. Binkey has gotten calm since I saw him yesterday. He's such a sweetie now and is fur is just so soft! Your dog is so cute! I wish my dog had long beautiful hair like his! Your Little Binkey is a lovley dod. I have seen three maltese chihuahua mix that looked more like the maltese but they were either 9 to ten pounds and more than one color. But little Binkey, WoW! So far he is the best looking I've seen. I would love to see more piture of him. Beautiful Dog! I find your little Binkey to be beautiful, he sure does not look like the usual Malchis do. 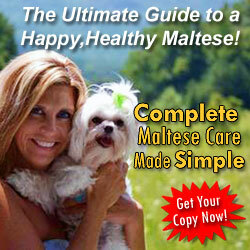 I have looked at what seems like thousands of Maltese mix pictures and almost nome of them look alike. It just fasinates me the differences there are. My little Belle is a Morkie and there again almost no two look alike. Belle's litter mates all were Yorkie colored like their mom or kind of butterscotch colored, Belle is black and white. She weighs 6 pounds at 16 months but I've seen Morkies that weigh 10-12 pounds. I guess that's why we love the Maltese breed mixes. They are kind of like a surprise in a box! While Binkey may look adorable, he's not very nice. The owner of this lunatic dog is my auntie. He tends to bite and bark at people for no apparent reason. He is a little tinkler (which made me give him the name "Tinkle Bell"). He can sometimes be nice (at points :/) but when my dog comes over, he acts mean towards him but Jet's(my dog)not stuttin him ;). This goes to show that you can't judge a book by it's cover or a dog by it's bark. He may only be 6 pounds, but in his mine he rules the world :P!